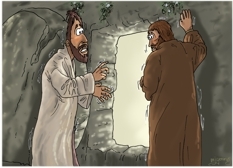 3 Peter and the other disciple ran to the tomb to see. 4 The other disciple outran Peter and got there first. 5 He stooped and looked in and saw the linen cloth lying there, but he didn’t go in. 6 Then Simon Peter arrived and went inside. He also noticed the linen wrappings lying there, 7 while the cloth that had covered Jesus’ head was folded up and lying to the side. Verse 1 informs us it is “Early Sunday morning”. Verse 1 of John chp 20 tell us “while it was still dark”. I have drawn this scene with the glow of the rising sun off to the left, with a feint hint of yellow sunshine seen on the left hand edge of the tomb stone. The other source of (supernatural) light in this scene is coming form the tomb itself. I have include this to illustrate the sense of the power of God in the resurrection of Jesus. Simon Peter is the figure on the left and John (who refers to himself as “The other disciple” and “the one whom Jesus loved”, who was the brother of James, and son of Zebedee) is on the right. Both are shaking – from their run to the tomb, but probably also from a sense of fear, amazement, anxiety, etc at what they are seeing. I drew this scene on request from a friend in the USA. It helps to round out more of the mazing story of the resurrection of Jesus from the dead. I have used my previous scene (John 20 – The Resurrection – Scene 01 – Stone removed) as reference, so that the tomb and stone look the same in both scenes. I have also include the Caper plants (Capparis spinosa) and flowers from that previous drawing in this scene, which helps with continuity.